I agree with what so many other have already said. Forum for sure and specifically this forum. I feel like this is a safe and friendly way for fellow quilters to connect. I have been looking at posts on this forum since last May. It started with my search for used machine, but it has become so much more. I really learn so much every time I read the posts and look at the pictures of the awesome quilts people are making. There are so many amazing talented people on here and I thank you all for sharing and inspiring a newbie like me. I hope this forum stays strong. Love this forum! I don't post much but I love reading everything, learning new tricks, and am happy that it is non-political. Not crazy about FB. Enough said! It seems like each has its place but this forum just seems to be family. I've followed it for years and you kinda grow attached to folks here. I usually just read and don't post but I hope to do better. Without this forum I doubt that I would be Longarming. Many great gals and guys here to share their expertise. I'd love to see it back the way it was! I may be the odd one but I like both. I have been on this forum since 2010 and have learned SO much from everyone here. I know I'm a better quilter because of this forum. The support is awesome. Although I have had a hard time with this format since it changed and have really not used it as much as I use to. Probably more my lack of tech ability than anything else. The "I Love APQS" FB page is the only quilting group I'm a part of on FB. I've gotten help and shard pictures there. I've learned if I just leave it on that page, the posts there are the only thing I see. I really like this forum. I have learned so much from all of you and continue to learn! I have been frustrated with yahoo forums due to them getting hacked so much, so am a little leery of those. I got started on FB before an all school reunion and it is great to get in touch with old friends, but it can be overwhelming to keep up with. I really do enjoy the specific FB forums I have joined. Am kind of re-obsessed with Singer Featherweights, (I'm currently experiencing a second Featherweight frenzy), and I check in with an IQ FB forum quite often. It's almost too much, all of the information out there now. Mary Beth, I'll be checking out your page! Mary Beth's FB group is a great one to join. There's lots of eye candy to look at and of course Mary Beth's wonderful personality. You are so kind!! Yes, you are welcome to my page. I tell everyone, every now and then, "remember we are a no politics zone". I should say no drama too...but so far so good, lol. We are planning a retreat this summer in June. It will be in Nebraska. As a matter of fact, all of the participants are form the APQS chat over the years. Should be fun....and the good news is we have one opening left. If you are interested, PM me, I will tell you all about it. I am new to this forum. I have also been out of quilting due to medical things. I also would like to say, you all here do seem to "care" when someone posts and needs help. How refreshing in these days of..
And can I install it myself as I am have no "working" reps in my area. Welcome back to quilting Maribeth. In regards to the robotics systems you really need to try them out if at all possible as they work differently. IQ is a Linux (sp?) based system that is motor driven. Quilt Path is a Windows based system that is belt driven. Decide what features are important to you in a robotics system then compare the two systems to see how they stack up. Maribeth, Welcome. We have had the topic of which computer system is best on this forum a number of times. Try doing a search and I bet you come up with loads of information. The majority of people seems to prefer IQ over QuiltPath but I could never really get an answer as to why. I finally ended up contacting Angela Huffman of Quilted Joy because she was the only person I could find who seemed to be really good with both systems. And she was... she answered all my questions in detail, and I have ordered IQ through her. It hasn't arrived yet, so that's all I can tell you right now. Angela assured me I would be able to install it myself, and if I needed help I could just call her, and she'd walk me through. We will see how that goes... I am so excited. I have IQ and I think it is really easy to use. I agree with earlier posts - since this was posted here on the Forums, you're going to get answers skewed to the Forums. I will admit that I don't spend much time here on the Forums anymore, just pop in a couple times a day to see if someone needs help. I used to be here constantly. Now, much more of my time is spent on Facebook - partly because that's where I can keep up with family and friends, partly because that's where I can also keep up with customers. But mainly because of the immediacy of the two APQS FB pages - We Love APQS and the QP User Group page. Any post on either of those pages pings immediately to my smartphone and I can usually answer questions there within a few minutes. A question here requires me to open the Forums page, notice the question and then hope that the person seeking help is ALSO actively on the forum. There is definitely a delay in seeking and getting help here, and customer service is my prime concern. Where search functions are concerned, both of those FB pages have a Search box - you just need to put the appropriate terms in the box to get the info you need. If someone needs help doing this, let me know - I am the "queen" of search terms! I am one of those who refuses to do Facebook (or rather Facebook do me). I have been reading the forum for the past 10 years and have learned so much from the folks sharing their experience and knowledge. I admit I have never posted a picture. Didn't take the time to learn how to do, so shame on me. The forum used to be a hopping place with lots of information. Now it seems to be just a used machine for sale site. So sad. I like this forum for searching for useful information. I find that I have to sort through too much on FB. For me, FB is for looking at pictures and giving people props for work they do. I haven't been active on these forums much. Mostly because I've had a life change that lasted many years. Now that I'm trying to get back to the living I hope to read more and share more. I have noticed that the forums aren't as busy as they used to be. I hope that changes as people tire of FB. I'm not on FB nearly as much as I used to be, however, I'm trying to start a business and it does seem that it's important to keep up with social media in doing so. I do love seeing pictures, so am leaving one here for the next reader. 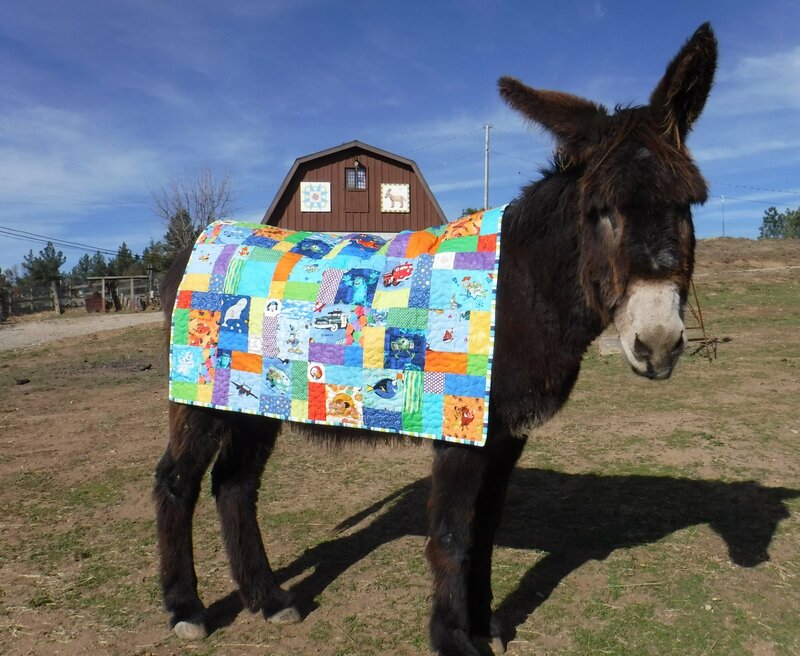 This is my mammoth (donkey) named Boone, modeling a colorful Disney character quilt that I made to go in a Disney themed room. Your Boone is doing a good job modeling your beautiful Disney quilt. I don't know which is the cutiest, the quilt or Boone. I really enjoy this forum, but I will admit, I forget to check it regularly. I wish there was more discussion on Quilt Path. As a newbie with it, I'd like a reference library of questions with answers for it. I guess I want to know everything - like know it yesterday, and some things just take time.